Lightweight aggregate is also called the ceramsite. which is a kind of ceramic quality of a material of artificial particles, high strength, fire prevention performance good weathering resistance and other functions. It is one of the most excellent of lightweight construction materials. It can resolve weight, fire prevention, heat insulation, thermal insulation, such as the engineering difficulties. The nature of ceramsite is resistance to weathering, superior quality and competitive price, environmental protection, easy to make. So it can be a host used in the precast wall panel (dry wall), interwall and lightweight concrete, the roof insulation, precast concrete, small lightweight block, ceramsite brick, etc., it can also be used for gardening, flowers, municipal, and soilless cultivation market, etc. The specifications ceramsite is 5-15 mm, the tube pressure strength is 1.5-4.5 MPa and the bulk density is 300-900 kg/m³. 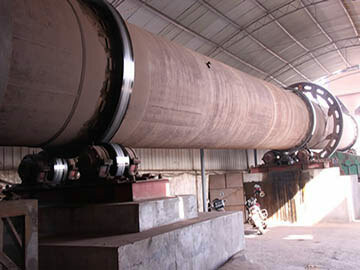 Our company make the technical reform in energy saving and comsuption reduction to the Ф 2500 single and double barrel ceramsite rotary kiln its ceramsite produc to raise the production from the current 180 cubic meters per day on average level to the ability to meet or exceed its original design , which is existing in domestic and foreign countries. And we can also improve the existing production technology and formulation according to the ceramiste product market positioning of the user requirements, the national standard and the physical and chemical properties of the raw materials likely can be obtained. We also provide the technical services the design of ceramist and its products production line, according to many years of production practice, aiming the matched system problem existing in the design of ceramiste product line.